On WTN "Shopping Bags" TV show: They tested four drum kits including a more expensive Tama Swingstar and a Sonor. They were honoured to let drummer Johnny Fay, from platinum-selling Tragically Hip, show his stuff. From the hosts: "The best bang for your buck went to the Yamaha kit: definitely a good starter kit that had an overall well-blended sound to it as picked by our listening panel as well as our professional drummer." We feature affordable entry-level to mid-level kits for the student, semi-pro or hobbyist. Our range from the brands shown below gives you the best balance of value and performance available at this level. We are proud to be an authorized dealer for professional drum kits from Yamaha, one of the most respected brands in the business. Most pro drummers have a preconceived sound in their head of what their "perfect" kit should be. 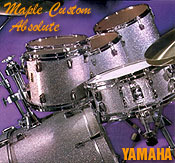 Yamaha's Oak Custom and Maple Custom Absolute offer exquisite sound for the discriminating professional. Expand your current set-up! Drum kit add-ons can include extra mounted toms and floor-toms, extra bass drums, and even side snares. Roto-Toms are another popular add-on because they are a way of adding three toms in an economical and space-saving way. Add-ons are a popular gift request for many drummers. Click on the logos to visit the manufacturers website. We know that drummers need certain items to lay it down right. At Allegro you'll find a selection of accessories including drum heads, sticks, brushes, stick bags, cymbal bags, cymbal cleaner, music stands and other goodies like finger tape and Gorilla Snot. We also carry lap-top practice pads so that you can practice your stick control whenever and wherever you need to.